When you start a new job and save it for the first time, Solid creates a file with the name you gave it and a ".cvj" extension. This file extension is what Solid uses to recognize this file and open it. When you close that job, reopen it and save again, Solid then creates a backup of that file with the name of the job plus a ".bak" extension (within the same folder). In the event the original job file becomes corrupted, you can change the ".bak" extension to ".cvj" and Solid will open it (provided the ".bak" does not contain the same corrupted content as the original file). It will contain the updates that were made up until the time you last saved it. You will also have to change the first part of the file name because two ".cvj" files can't have the same name. Solid also creates an ".asv" file which is also a copy of the original job. In the event Solid closes abnormally, you are given the opportunity to continue using this file when you reopen Solid. If you don't get the prompt to continue using it, this file can also be renamed to ".cvj" and opened by Solid (if there was time for the system to properly save it). 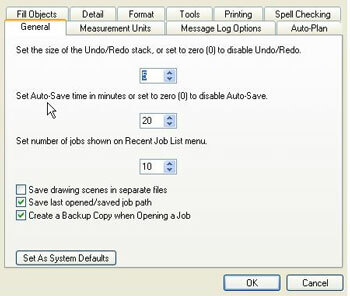 The time frame between updates to this file is determined by the Auto-Save setting in the Preferences screen. (Note: this function does not affect the content of the ".bak" file).